My friends Sean and Patrick Johnson are part of a fun and talented live puppetry company called Swazzle. They perform amazing shows at libraries, all over California, primarily in the summer. Swazzle is premiering two new shows this summer and have booked at least 125 gigs so far! I'm really excited to see B.A.R.K. The Robot Dog and Rex and Boots, Super Sleuths, not only because I always enjoy Swazzle production, but also because they both feature dogs! I was pleasantly surprised to find out that B.A.R.K. 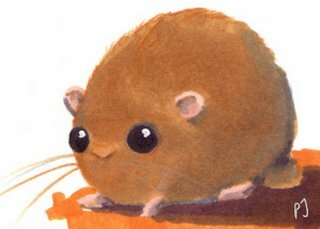 also has a hamster character. I saw Patrick's sketch of the hammy and loved it. I later found out that he'd seen photos of my hamster, Ami, and added a white stripe around the middle of the Swazzle character since hers is so cute. Here's a glimpse of the puppet. I think it's brilliant and can't wait to see it in action! Sean confirmed that the puppet does have the white stripe around the middle. Isn't it adorable? Illustration and puppet construction by Patrick Johnson. Photograph of hamster puppet courtesy of Sean Johnson. I saw this post on Yvett's site, listing 6 weird things about yourself, and decided to give it a go. This is rather difficult since I'm only limited to 6! I'm going to post the first things I thought of, a couple to do with blogging, appropriately enough. When I post my blog entries, I round the time to the nearest increment of 5. You will not see a post from me at 11:32 or 6:14. Now, if only I could self-select the times for the comments I leave on other blogs! I will edit and redit a post to avoid links being split between two lines, if at all possible. On days I have to get up for work, I generally set 5 alarms. Two on my clock radio and three on my cell phone. I check all of them several times before I go to sleep. There are still mornings that I oversleep. I am creeped out by eye stuff. I can barely put in eye drops and know I'd never be able to wear contact lens. Once my vision starts to go, I'll be sporting glasses. I avoid going to the eye doctor because the puff of air thing freaks me out. I can not file my nails. Emery board against fingernail is as bad as fingernail against chalkboard to me. I just clip 'em. Before getting out of my car, I have to make sure certain dials are in certain positions and that other things are off. Now those of you who know me are probably laughing and thinking I'm much weirder than the above illustrates. You are probably right. I've noticed lately, at least here in L.A., more specifically in Hollywood, that the homeless people are now using baby strollers instead of shopping carts for their belongings. It's just an observation. Anyone else noticed it? Or Why I Am So Fracking Tired! I failed to mention a cool art opening we went to last week. We barely got in to the super-crowded opening of the I Am 8-Bit exhibition at Gallery 1988. Eric went to last year's show, so we decided to see this year's as well. Apparently, everyone else in L.A. had the same idea! I think there are some other people who would enjoy seeing this video game inspired art. It runs until May 19th, so there's time to check it out. Most of last Saturday consisted of me sleeping. I had allergy fatigue and a headache. When Eric returned from the Newport Beach Film Festival around 10pm, we decided to head over to The Cha Cha Lounge in Silverlake to celebrate a friend's birthday. It was a cool place with an anti-beautiful people vibe, so I felt comfortable there. They played good music for the most part, although Brad and I could not figure out why "The Passenger" kept coming on every other song or so! There was a photobooth and a funky vending machine with everything from marshmallows to weird Japanese snacks. Oh yeah, and there was rum. Lots of rum. As I mentioned before, on Sunday we went to the Spring ArtWalk at the downtown art colony, The Brewery. We try to attend every Spring and Fall. We've become familiar with many of the artists, but enjoy seeing their work again, as well as their new projects. There are always new, creative things to see though. One of my favorite artists there is Ted Meyer. I'm still trying to find that perfect spot to hang the piece of his art that Eric gave me in December. I have posted some photos I took at The Brewery. Not many of them are of art, as a lot of the artists do not want their works photographed, which I completely understand. After the art walk, I drove to Torrance Sunday evening for The Color of We, a hip hop dance program to raise awareness of HIV/AIDS, as well as raise money for a local healthcare center. I met up with a group of friends and we cheered on our buddies who were in the show. It was really well done and pretty powerful. I think everyone has been touched by HIV/AIDS, even if they don't know it. Most of us do know it though and have friends and/or family members who have died from complications or who are lucky enough to still be fighting. The show was really targeted toward young people, who I think have gotten blase, thinking it's no big deal anymore and if they get it, they'll just take a pill and be fine. Um, yeah...no. Since gas prices are so high, it now seems I drive all over the place! Torrance on Sunday and then back to Newport Beach Monday after work for Eric's screening. His short film played in the "Sofa King Funny Shorts" block. I really didn't get the name at first, but I'm not known to be very clever. It's a nicer way of saying "So F**king Funny...," in other words, the comedy shorts. It was a good screening, with a large, receptive audience. An old friend of Eric's from Philadelphia turned up and we saw a filmmaker friend from Utah who had a film screen earlier that evening. So, yeah, I've been busy. My house has been a bit neglected and I really need to get on top of things. I have a friend I haven't seen in 20 years coming to L.A. this weekend and even though she isn't staying with me, I may want to show her my home. Or not, depending on the state of it. In a couple of weeks, we have friends from San Francisco coming down and they will be staying in our guest room. Our guest room which has become a ginormous closet! You can barely walk in there. Crap, we have a lot to do. Not too much exciting going on with me these days. I've been dogged with allergies this past week. So, I'm pretty tired, from the allergies and the medicines. I ended up sleeping in yesterday. We'd hoped to get up early to head down to the O.C. (ick) for a big Pet Expo. We did go, but only had about 45 minutes to run around, which was plenty to see all of the dogs, a few bunnies, and some sleeping hamsters. I even purchased yet another "remove the pee from your carpet" product that I hope works. Nothing else really has in the past. (Little Guy has a problem). After the animal fair, we headed over to the Newport Beach Film Festival at Fashion Island. Eric has a short film ("The American Infant") in the festival on Monday. There really wasn't anything we were interested in seeing, so we head north on PCH and stopped in Long Beach for dinner. Ribs seemed in order, so we ate at Lucille's Smokehouse and had some really good food, including fried dill pickles. Yum! There are a couple of cool events I'm planning to attend tomorrow. It's officially Spring and time for the Brewery Spring Artwalk. I always enjoy checking out what's going on at this art colony near downtown. In the evening, I'm attending a benefit show called The Color of We, a hip-hop dance show presented by Culture Shock L.A. I know, you didn't think I was part of the hip-hop world, did you? Well, I'm not, but I'm good friends with the company director of the Culture Shock dance troupe, as well as one of the other dancers. Well, I did it. I created my very own "Easter Turducken," which I like to refer to as an Egg Peepunny. You can check out the photos here. This just may be a way to, at least temporarily, cure sugar addiction. Dude. I still have lots left over in the fridge if anyone wants to try it! I'm still on the lookout for a leftover hollow chocolate Easter bunny. A co-worker may have one for me, but she thinks it may be solid. I'm thinking about going to Big Lots after work, but my hope is waning. I really wish I had something interesting to write about, but I'm tired, very irritable, and feeling incredibly bitchy and snippy today. Yep, it's hormonal and that's all I'll say about that. As I roast my Peeps. A lot of schools are now on Spring Break, but here I am back to work. So far, not so bad. Not much traffic this morning (see above). 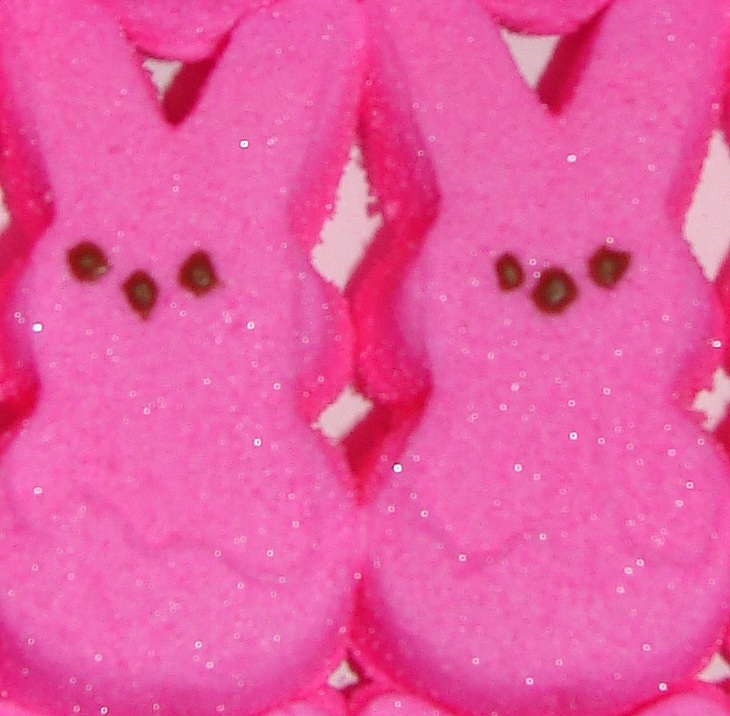 A co-worker bought me some bunny Peeps! I might be seeing Aimee Mann tonight. She plays L.A. pretty regularly. Another time. And if not, I guess I'll get a nap. Zzzzzzzzzzzzzzzzzzzzzzzzzzzzzzzzzzzzzzzzzzzzzzzz! Here it is, almost 1:30am and I'm still up. No big deal for the past several days, as I had time off. But, it's back to work in a few hours. I was tired earlier, but have gotten my second wind. 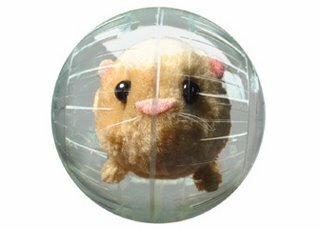 I'm reading blogs, searching for discount books online, and watching Ami run around in the hamster ball. Since I'm a little wired, I'm going to go lay in bed and read a bit, which will hopefully help me calm down. I have the new issue of Rolling Stone with beautiful Kiefer Sutherland on the cover and some Ray Bradbury short stories I'm reading. I'm finally getting up to speed with downloading podcasts to my non-iPod mp3 player. Considering the state of L.A. radio, and my lack of any satellite radio subscription, this is a nice alternative to listening to my music (which I still do...I just like options). I'm finding it very useful in the mornings. I'm an NPR junkie and like that kind of programming on my drive to work. However, I listen in the shower and while getting ready for work. By the time I get in my car, NPR begins to repeat. So, what shows am I'm enjoying? For awhile now, I've listened to GeeksOn with Eric. One of the geeks is a friend of ours. It's a fun show, but a bit heavy on the video game geekiness for me, as I'm just not into gaming so much. On Ren's recommendation, I checked out The Word Nerds. Their podcast is great! Another favorite is Science Friday. I love the show, but often miss it, so now I can catch up. There are also several NPR podcasts on subjects ranging from the media to technology to pets. I had to make some room on my player to use it for the occasional podcast. I had nearly filled the 20 gigs with music. How often was I really listening to The Lord of the Rings trilogy soundtracks? Rarely to never, so I removed some stuff like that. 95% of the music on my mp3 player is ripped from my own cd collection anyway. And the other 5% is from Ren's. In case anyone mistakenly has the idea that I live a glamorous L.A. life, let me tell you how I spent my Saturday afternoon and night. I arrived early to help Eric set up screens, projectors, etc. for the movie division meeting of the Stereo Club of Southern California (as in 3D, not hi-fi). We were there from 4:00pm until about 2:30am. Parts of the event were fun, there was good food and many of the club members are fun to chat with, but the night just dragged on too long. And frankly, some of the geeky conversations went way over my head. Today we slept in, to recover from last night, and then ran some errands. First, to Best Buy to and then to Petco for a hamster motorcycle (aka "Critter Operated Chopper"). It's super silly, but I just couldn't resist, especially since it was on sale. I'll be trying it out tonight and post photos of the occasion soon, I'm sure. After shopping, we had dinner at our favorite Mongolian barbeque restaurant, Mogo's, in Sherman Oaks. I noticed an actor from 24 sitting at the table next to us. Eric kind of knows him through a mutual friend and decided to say 'hi' when we finished eating. I hurried off to the restroom while they talked about an upcoming poker game they'll both be attending. I just couldn't risk the possibility of saying something completely inane and inappropriate like "Tell Kiefer I love him." It's so sad when you can't even trust yourself. I mowed the back jungle yard today. It was really overdue and I did my best to pick up as many of the dogs' toys as I could. I missed a tennis ball, the tiger-striped one, in the very tall grass. Oh well. Rusty will never know. Yes, you read that correctly. I mowed my lawn, which is rare for most folks who live in L.A. Many of my neighbors have their regularly scheduled immigrants who take care of their landscaping (and they do have much nicer looking properties! ), but we choose to take care of it ourselves. No, I'm not making a statement on immigration here. I'll save that for another time. I have a story I'd like to tell related to the subject, but need to figure out how to do so. Nevermind, I can't tell the story here. I try not to get too political on this blog, so I'll just say that it makes me sad to know that some people live in places where conditions are so horrible, that they risk everything to come here, often illegally, and end up still having a crappy life. She also reminded me of my love of A.A. Milne collections when I was a child. My favorite poem was "Rice Pudding," about poor Mary Jane who does not like rice pudding and refuses to eat it for dinner...again. That's my interpretation anyway. Being a picky eater and hater of rice pudding myself, this piece speaks to me. I can tell you what the matter with her is. It's that damn rice pudding 'they' want her to keep eating. No wonder she's beting a brat. I can totally relate! Il n'y a pas de soleil aujourd'hui. Le ciel est noir aujourd'hui. Et je ne ris pas. Parce qu'il ne m'adore plus. Chris Palmer called me out. 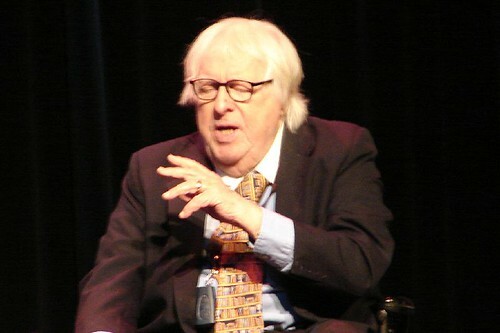 I claimed to have nothing to blog about and he couldn't buy that, seeing as I heard Ray Bradbury speak Wednesday night. CFI-West sponsored an event with author M.G. Lord in conversation with Bradbury. I've heard him speak at a few other events over the past few years. At last year's San Diego Comic Con, Bradbury was on a panel with Forrest Ackerman and Ray Harryhausen. It was almost painful, as it was poorly moderated and not accomodating to the age-related hearing difficulties of Ackerman and Bradbury, in particular. In spite of Ray Bradbury's age and subsequent health problems, he is sharp and snarky (some may say curmudgeonly), entertaining and inspirational. He does ramble a bit when answering a question, but I think he has earned the right to do that and no one seemed to mind. It is part of his charm. Ray Bradbury's take-away message was that he is optimistic for the future. He recommended that everyone stay in love with their pursuits, as well as read at least one poem and short story before going to bed each night. Simple, but sage advice. Not original though. I mean, Ren has been telling us to read poems too! Ever have one of those days where you really want to update your blog, but you've got nothing? That's me today. It has been a while since I posted any haiku. Ren clued me in to a request for haiku, in celebration of April being National Poetry Month, put out by the All Cupcakes, All The Time blog. So, I cranked a few out. I get on a roll with writing haiku and no, they don't all come out good, but I just keep going for awhile. I sent all of them in and one got published on the site! "it's time to make the donuts"